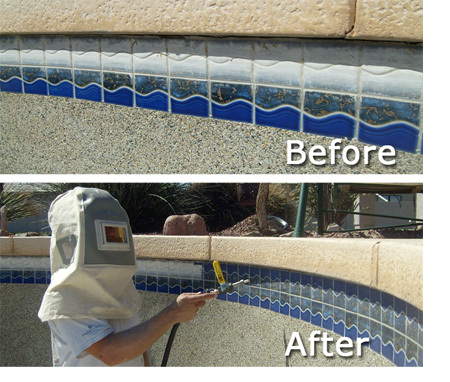 Periodic tile cleaning, through brushing the tile walls of your swimming pool helps eliminate algae problems. Keeping the tile clean in your pool saves money, as once tile becomes calcified it becomes like hard plaque and requires much more time and a professional to clean your pool. We use the glass bead method for tile cleaning. Glass beading is a fast, safe and effective technique which removes calcium and scale deposits on pool tile. Rather than putting harsh chemicals in your pool when we clean the tile, we’re simply blasting the hard plaque off the tile. Using the glass bead method, you’ll be able to use your pool as soon as we finish the tile cleaning.